Our trip to Dayton from Florida had several highlights. We spent 10 days at our favorite Tennessee campground, Defeated Creek. Between Knoxville and Nashville, just north of I-40. Stayed there several times before, but not with the Lil Taxi. This time we did some exploring of the countryside. Unfortunately for you, as lovely and picturesque as the surrounding many miles of hills and valleys were, we shot nothing. Frankly, I was still recovering from the mental challenges and work of the past months and was simply enjoying our surroundings. It worked! 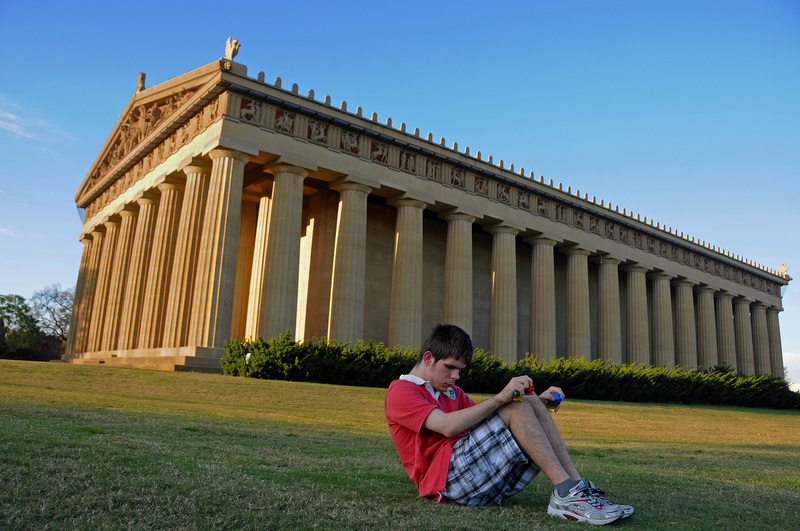 We had two noteworthy forays into Nashville, and took some pictures on one. The first trip into town was for the purpose of finding live music for the boys. Our lives are never dull, and Ross was presenting a puzzling challenge as we walked from place to place along Broadway and stopped in the doorways to listen. He wanted to listen, but didn’t want to go inside. Ahhh, we finally found his pleasure: a female singer and a loud guitar band! Inside, he shortly was dancing! Too bad for you again: too dark to shoot! I tried. We all arrived back at the coach that night almost completely destroyed, we were so tired! The next night when we went back for more music, the boys were still so tired we gave up and went home! We leave Dayton in the morning to catch one last appointment about the twins near Cincinnati. We will head south to Louisville for the night, as the start of our trip to Austin, TX. I promise to help you stay with us as we move! We sure ran the wheels off the Lil Taxi while in Florida! One day we ran clear across the state to the Gulf coast. Drove out to the end of land at Crystal Springs (passed a little dirt road named Hide-A-Way Dr, same as the street where Robyn and I lived for 17 years!). Living out on a series of islands in the name of peace and tranquility, these people are so exposed to the raw power of nature! 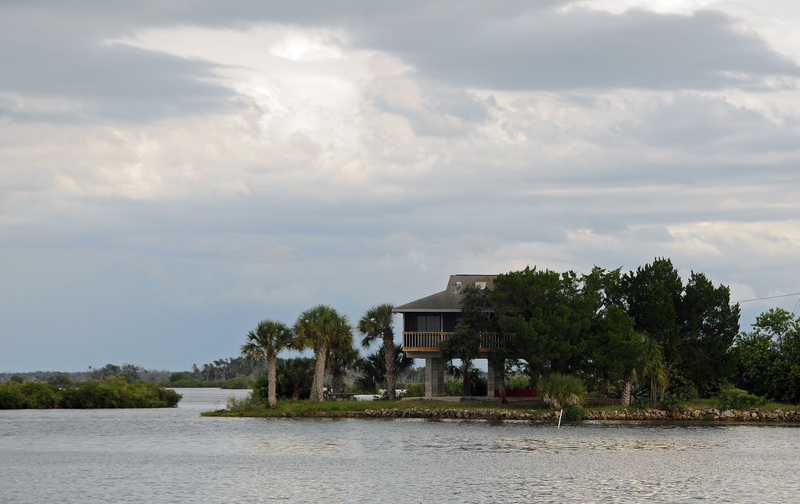 They build their homes on one-story stilts because of the Gulf and its storms. Remember I mentioned how the humidity makes everything grow? Spanish moss grows everywhere. Check out the patches starting to grow on the trunk of this palm tree. We saw long sections hanging from electric wires across the road! With sundown fast approaching, we reluctantly turned toward home. 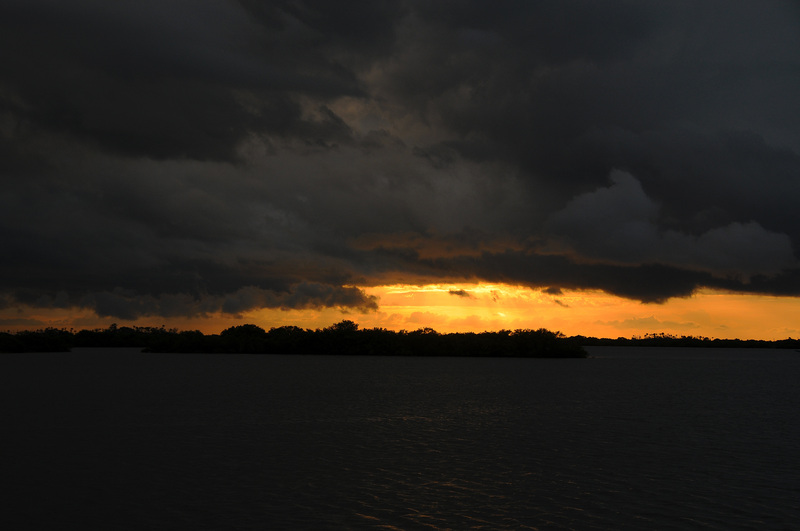 All day we had encountered heavy clouds overhead that threatened rain but never delivered. Sundown offered a glorious scene as the clouds departed. Although this jaunt occupied about 250 miles round trip, we really wanted to see more of the left coast. The perfect opportunity occurred the next week. 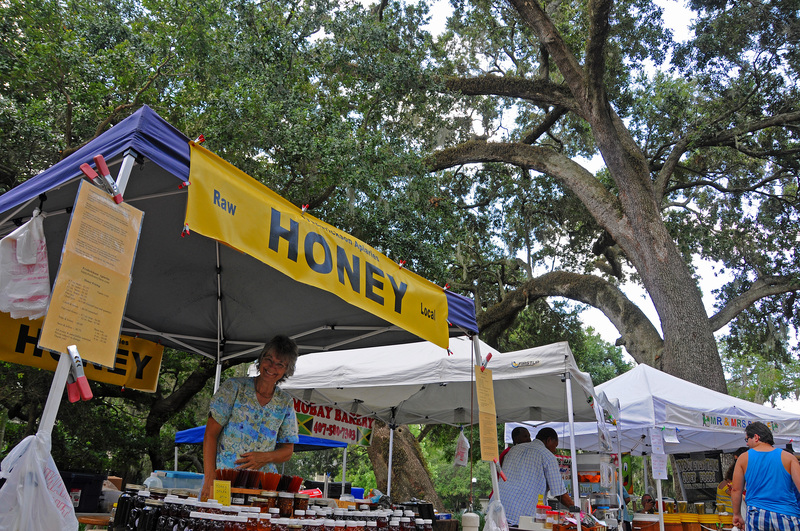 We heard that Tarpon Springs was an enclave of people of Greek descent, and the town was filled with the best Greek restaurants. Since I missed the Dayton Greek Festival for the first time in 30 years because we were down here, we HAD to make up for it. The reports were correct….fabulous Greek food. Opa! 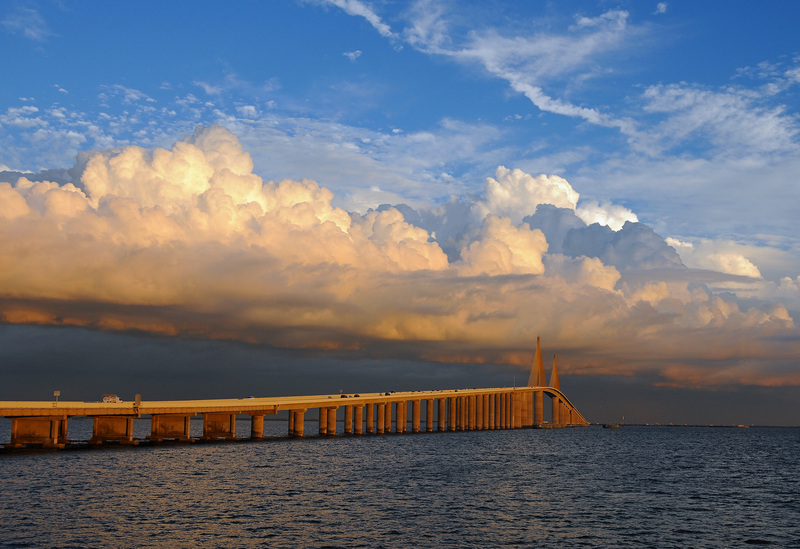 Celebrated by driving down the coast through Tampa and across Tampa Bay on a cool bridge right near sunset. About 325 miles on this day’s jaunt, and worth every inch! Robyn and Marion’s dad flew in to add his condolences and comfort. Because Marion and her husband, Bill, had really enjoyed each other’s company and had really felt fulfilled by their work, his loss was quite substantial. But Marion spent her effort and time voicing and picturing all the fun times and accomplishments that involved Bill. The memorial event was billed as a “Celebration of Bill’s Life”, and the tone was very upbeat. He had been a #1 kidder, and everyone had a story to share! It was good, and we were all glad to share in it. Check out the faces of the two sisters; Dad’s no slouch. So, hey, as long as we’re all here….let’s do some sightseeing. It’s the 50th anniversary of the establishment of NASA, and since the Kennedy Space Center was only about 30 miles away, Dad and I decided to go do a tour. Not just any tour….they’re doing special ones clear into the huge Vehicle Assembly Building because no projects are active there for the first time since it was built. 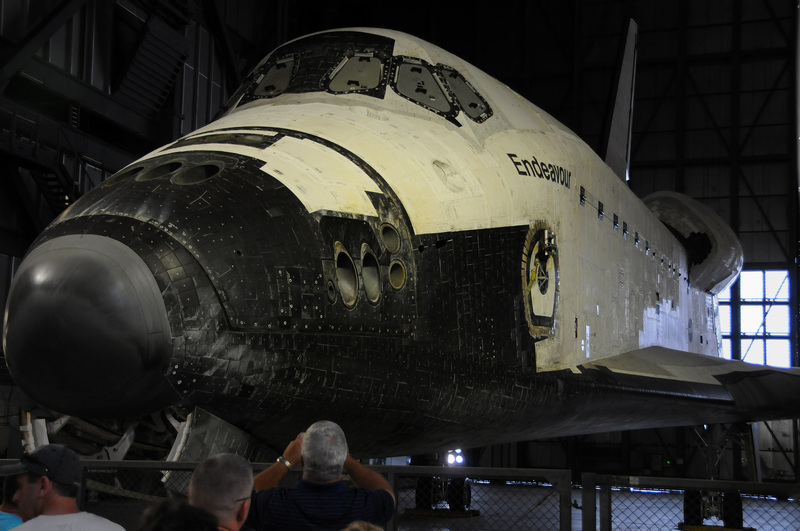 As we entered, lo and behold….a familiar nose poked around a corner: the Endeavor shuttle was sitting inside! Our visit occurred just days before Endeavor was flown piggy-back to its final resting place in LA. It was in the VAB for safekeeping until the flight! We could almost touch the nose…. Still, our tour was heavily managed, and we never got a good chance to shoot photos of the building. 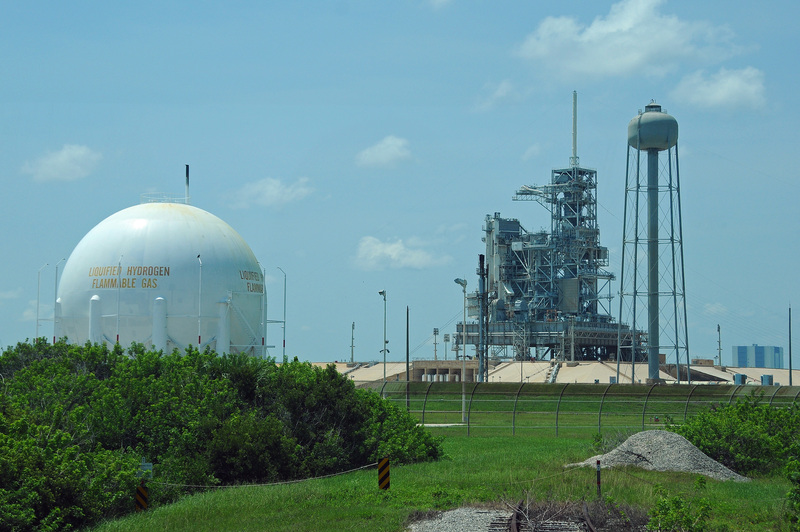 In the shot of the one shuttle launch pad (there are two, but the other is nearly dismantled), the VAB is way in the background on the right….3 miles in the background, still quite visible due to its size (fourth largest building by volume in the world). There is a separate building devoted to the Apollo spaceships and the Saturn rockets that sent them into orbit. 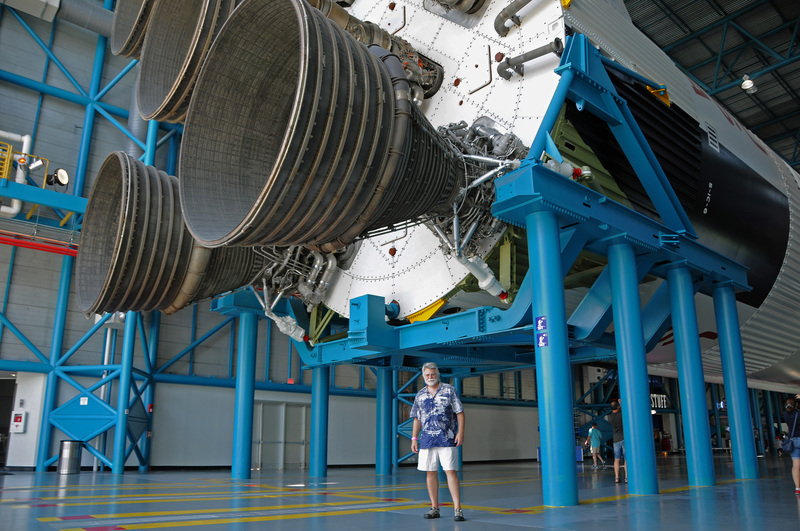 I’m standing under the five engines that power the first stage. We think, “wow, that’s an amazing rocket!” But wait, there’s more. Stage two has five more! Stage three has another! The space capsule has yet another, smaller engine. We toured through the original control room, which was set up with its computers and large monitors all synchronized to show an actual launch. It was too dark to shoot without a tripod, sorry. Fabulous day of discovery for us. Wish you were there. Robyn’s sister, Marion, lost her husband without warning in the prime of his life at 56 on July 17. 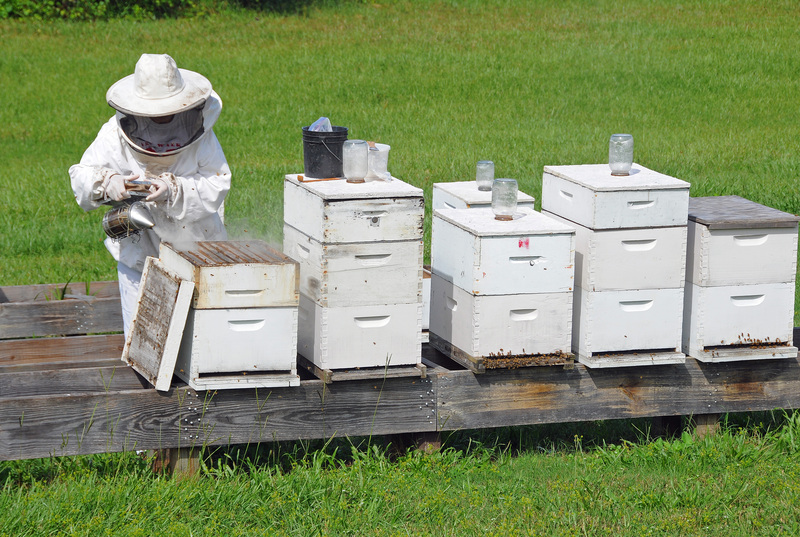 They had been operating Happy Bee Honey Farm, with many hives on their property and weekly appearances at local farmers markets to sell the amber goodness. 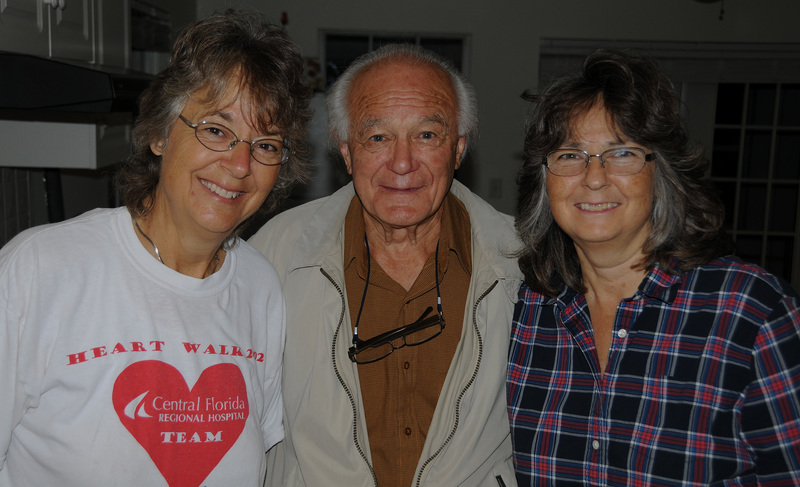 It was an operation that not only supported them both financially, but also brought them great joy and satisfaction. She was suddenly without the love of her life, and she faced the entire load of work and responsibility of their home and business. So we buzzed down to offer a shoulder and a helping hand for a few weeks. We stayed for seven weeks! We suffered in the humidity, we worked like slaves, and lived out of suitcases in her house. Actually, no suffering was involved….we lived and ate like kings and queens, took day trips that provided endless novelty and reward, met up with some very dear friends and classmates from w-a-y long ago, enjoyed the run of Marion’s house (and her master bedroom! ), and spent countless hours with Marion as she kept her head above water with everything that was going on! We liked it so much, we paid an electrician to put in a big 50amp plug on the outside of Marion’s house, and bought two huge extension cords, so we could park the Taxi on her property (you have to run the AC even when the coach is empty, otherwise it gets so hot sitting outside that things melt inside). So when we go back this Christmas and into January….during high tourist season….not only will we have a reserved place to park, but we won’t pay those incredible high season prices! Cell signal too weak….will post tomorrow evening. 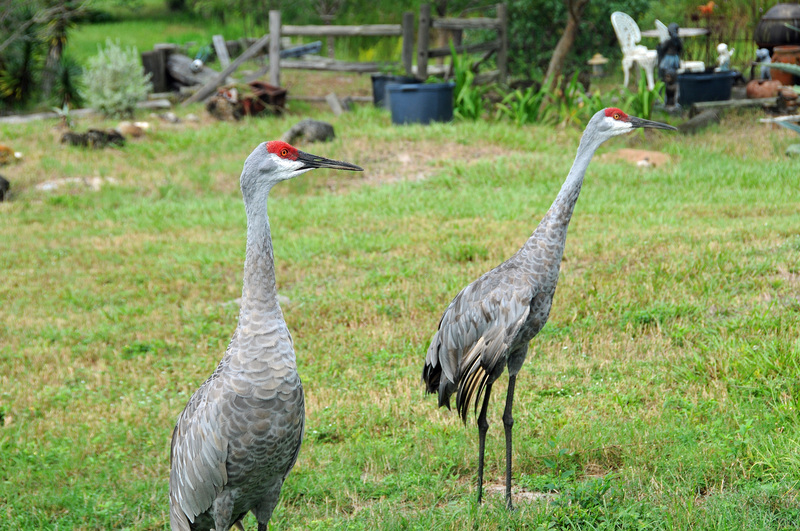 So we arrived in Geneva, FL in mid-August. Everyone not in Florida talks admiringly about the temperatures in Florida. Yeah, but we went there in summer when the average high for August is 92. But it’s 86 for Dayton. No, the real point to pay attention to is the humidity. Oh baby, it’s a sauna every day in Florida! And no point in washing the car, because it will rain later today. Oh, and Love Bugs….don’t get me started about those little devils and the mess they make on the car. Okay, so do you get anything for all this suffering? 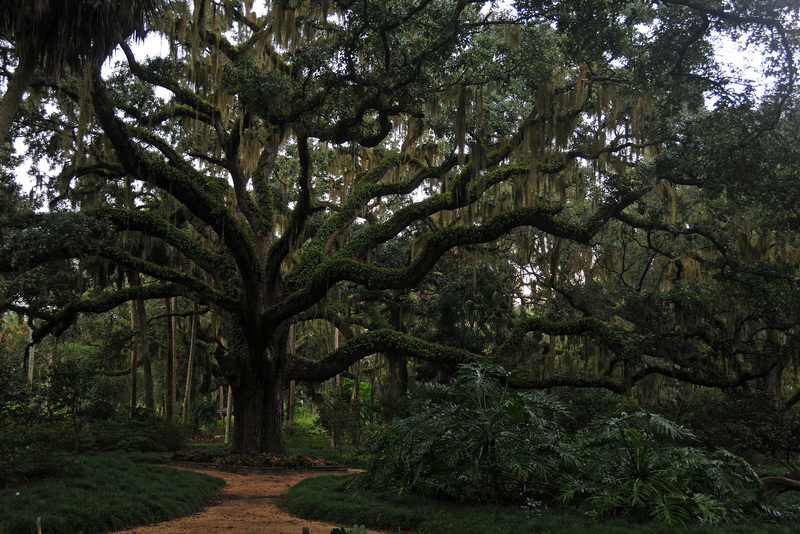 Look at this incredible oak tree: not only is it massive, not only is it completely festooned with Spanish Moss, every branch is covered with a thick blanket of ivy! 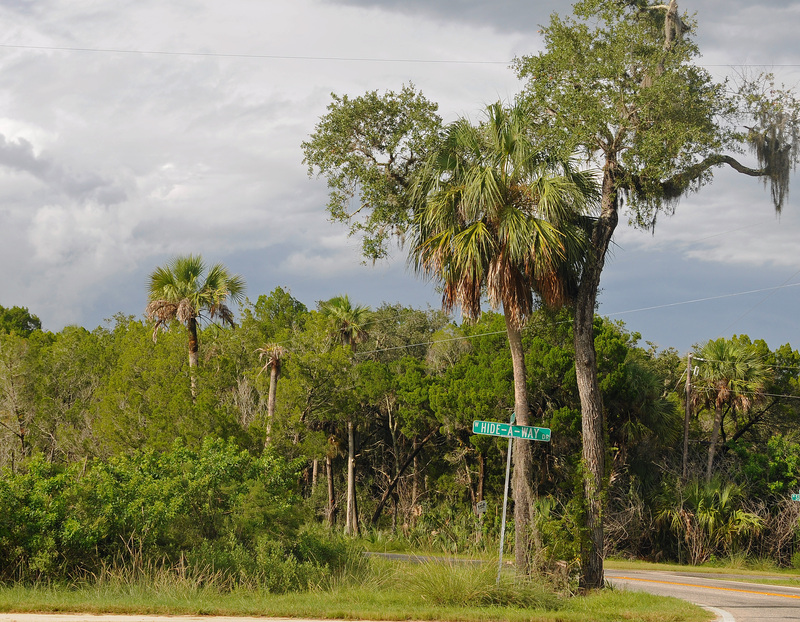 Just across the coastline highway from this tree and its brethren (and cistern?) the beach was strewn with these remarkable rocks. 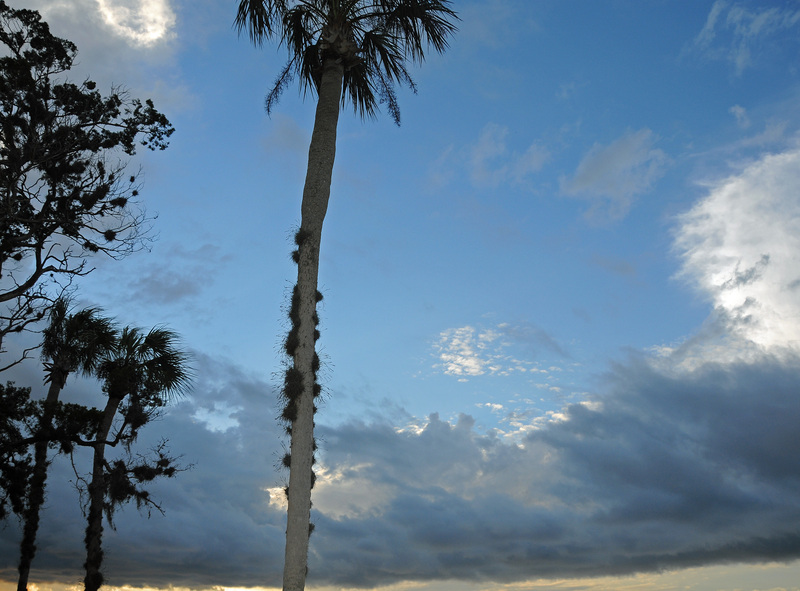 V-e-r-y rare along the Atlantic coastline in Florida. 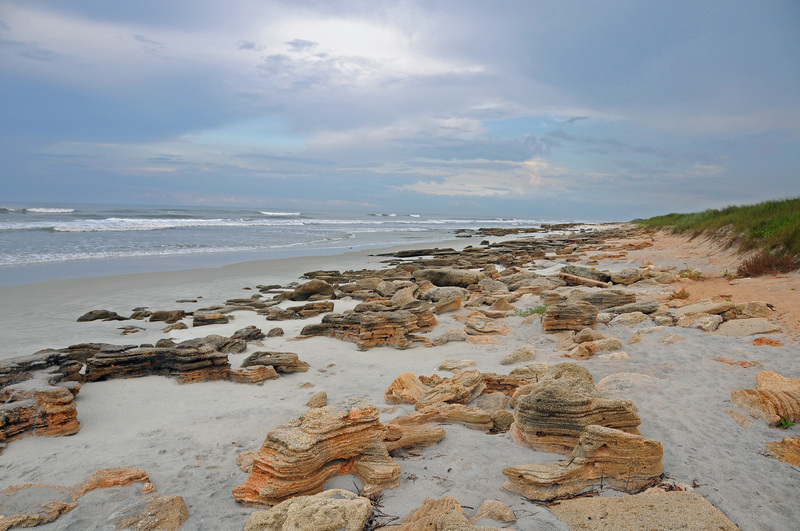 We were only a few miles north of Daytona Beach where everyone can drive on the sandy beaches.